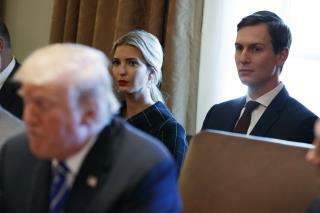 (Newser) – As of November, Ivanka Trump didn't have a permanent security clearance. Neither did Jared Kushner or Sarah Huckabee Sanders. They were among more than 130 political appointees working in the Executive Office of the President with only some form of temporary security clearance by President Trump's 10th month in office, NBC News reports. Documents reveal 85 political appointees in the White House, vice president's office, and National Security Council didn't have permanent security clearances. Same with 50 appointees in the National Economic Council, the Office of Management and Budget, and other offices tied to the West Wing. Big names include Trump's social media director Dan Scavino, his assistant for strategic initiatives Christopher Lidell, top White House counsel Don McGahn, and deputy press secretary Raj Shah. Right off the bat you named the top three village idiots who have no business setting foot in the WH. Keep the list going! I couldn't care less. Interim security clearance, permanent one, whatever. Now and EPA chief who doesn't think global warming is a real thing.... That's a pretty massive problem! These are kids in the WH. Their boz0 old man sneaked them in. Such a dysfunctional admin.